Padma Studios® is a multidisciplinary fine art studio in Los Angeles, CA, led by master Tibetan-Bhutanese artist Pema Namdol Thaye. Enjoining the rich artistic heritage of the Himalayas with master craftsmanship and unparalleled design, we are committed to the highest standards of artistic excellence and spiritual integrity in all that we create. Our multidimensional artworks include celestial three dimensional mandalas, traditional and contemporary paintings, sculpture, fine art publications, and architectural design. It is our pleasure to welcome you to our website, and to invite you to contact us with any inquiries you may have. With roots in the Tsarak lineage from Kham, eastern Tibet, Padma Studios® founder Pema Namdol Thaye attributes every success in his life to his two heart-teachers: his mother Yogini Tsarak Sonam Lhendu, and his principal artistic and spiritual mentor and uncle Lama Tsarak Gonpo Tenzing Rinpoche. It is in their honor—and through the blessing of their lineage—that Padma Studios® was founded in 2008. Born in eastern Tibet in 1920, the Ven. Lama Tsarak Gonpo Tenzing Rinpoche entered monastic life at the age of seven in the Nyingma Kathog tradition. The two main monasteries in which he resided and attended most of his studies were Tsarak Monastery and Kathog Monastery, one of the oldest—some say the first—Tibetan Buddhist monastery in Tibet. Lama Gonpo studied Four Sciences throughout his monastic training: logic, philosophy, language, and the arts - mastering all to a degree that would later render him both highly regarded and widely sought by the great lineage-holders of the Nyingma tradition as an educator/tutor and consultant in these areas. As a devout and highly perceptive Dharma student, Lama Gonpo was dedicated to exploring the vast scope of Buddha's teaching. From the time he was a young man he would travel to different regions in Tibet seeking teachings from various high Lamas. For studies in Buddha-Dharma, he principally studied with Khenpo Ngaga and his root Guru, Tulku Assey of Kham. In addition to his formal Buddhist training, as a student of sacred art Lama Gonpo also received training from his two principal art teachers: Master Sherub of Kham Sanen Rekhi and Master Yeshi of Bah Lingkha Shey. This pristine artistic lineage traces back to the illustrious and renowned Tibetan Master painters Phurba Tshering of Chamdo and Lama Orub of Bha Lingkha Shey. From 1941-1944 Lama Gonpo completed a traditional three-year meditation retreat. The following year he received the Bhiksu, full monk ordination, and was enthroned as a Lama (spiritual teacher). Three years later he was installed as Abbot of Tsarak Monastery in Tibet where he presided until 1952. Following the Tibetan diaspora, in 1960 Lama Gonpo escaped Tibet and took refuge in Darjeeling (and later Kalimpong), India, with his younger sister Yogini Tsarak Sonam Lhendu, with whom he had an incredibly close life-long Dharma connection. As a master of religious arts and rites, from 1955 onwards, Lama Gonpo was requested by esteemed Lamas such as Kyabje Dudjom Rinpoche, Mindrolling Trichen Rinpoche, Penor Rinpoche, Dilgo Khyentse Rinpoche, Dodrupchen Rinpoche, Kyabje Chatral Rinpoche, and Her Eminence the Royal Great-Grandmother of Bhutan, amongst others, to teach, consult, and perform the duties of Vajra Master during religious ceremonies. On many occasions Lama Gonpo served as the principle assisting Lama and personal attendant to Kyabje Dudjom Rinpoche, such as during important empowerment cycles which sometimes lasted up to six months at a time including twice for the Rinchen Terdzod Empowerment at Samye Monastery in Lhasa, Tibet, in 1955, and then again in Kalimpong, India, in 1963. 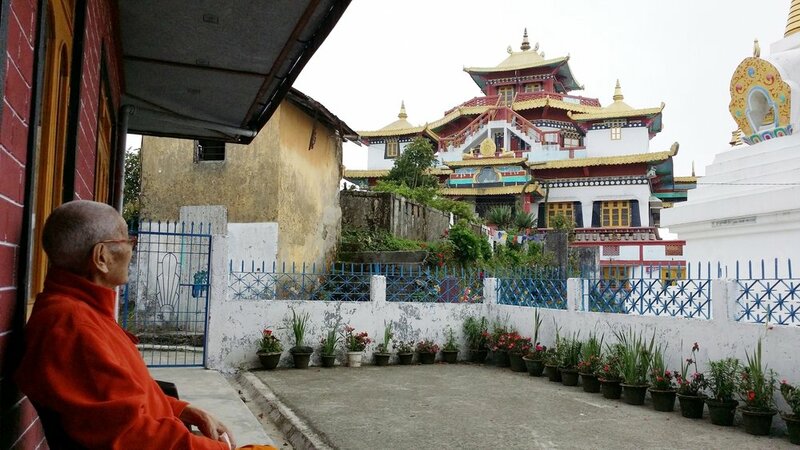 Kyabje Dudjom Rinpoche requested Lama Gonpo to spearhead the design and building of Zangdok Palri Monastery, the first Nyingma monastery built in exile, in Kalimpong, India. In 1970 Kyabje Dudjom Rinpoche appointed Lama Gonpo as Abbot of Zangdok Palri Monastery where he presided for thirty years. Master of the Science of Art – in the areas of religious thangka painting, calligraphy, the crafting of religious ritual items, and the building of three dimensional mandalas and temples. Not only possessing the knowledge and skill of the physical attributes of these areas, but also the more complex religious symbology and implications which accompany them. Though honored with these titles, Lama Gonpo himself was an extremely humble monk who always insisted others refer to him simply as "Ashangla" (uncle). Recognizing his rich artistic and spiritual training and mastery, Kyabje Dudjom Rinpoche implored Lama Gonpo to keep the flame of Nyingma tantric ritual arts alive, requesting also that he pass on the rare tradition of three dimensional mandala creation to future generations. Not being able to refuse this request, Lama Gonpo trained many Lamas, monastics, and yogis from different regions of Bhutan, India, and Nepal in all aspects of tantric ritual arts, which included an elaborate repertoire of chants, mudras, tormas, sand mandalas, empowerment mandalas, drupchen puja rituals, as well as mural painting. He trained students and Lamas in the three core roles required for Vajrayana ceremony: chant leaders, chopons (ritual guides), and Vajra Masters (master of ceremonies). Lama Gonpo also devoted endless hours teaching his two nephews—his heart-sons Kunzang Wangdi Thaye and Pema Namdol Thaye—an intensive artistic training which focussed on two-dimensional mandala and thanka painting. Pema Namdol further received complete training in three-dimensional deity mandala creation from Lama Gonpo. With his sister Yogini Sonam Lhendu, Lama Gonpo studied and served the Dharma for over eight decades. The depth of their accumulated knowledge, experience, and accomplishment provided a vital contribution to many Buddhist centers and enlightenment-seekers worldwide who were fortunate enough to have met them. In 2015 Lama Gonpo passed away peacefully in Bhutan, just weeks after the passing of his sister. They were both extremely modest and devout practitioners who exhibited extraordinary signs of realization at the time of their passing. Lama Gonpo achieved the state of Tugdam (a special meditative state) for seven days, leaving behind rainbow-colored Thung ringsel as a blessing for all beings.